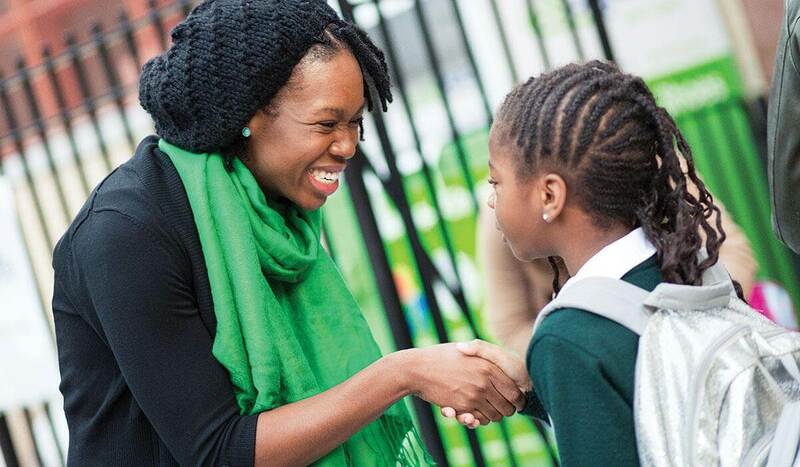 Principal Nikki Bowen ’08 greets a student at Excellence Girls Charter School. It’s just past 7:30 one June morning, and hundreds of elementary-school students are assembled in a gymnasium at Excellence Girls Charter School in Brooklyn, N.Y., preparing for the day ahead. The young scholars — mostly black girls with neatly constructed hairdos and big smiles — sit side by side in a large circle on the floor. Pink and purple backpacks rest on their shoulders, while they fold their hands in their laps and tuck their feet underneath their legs. Their eyes fixate on Nikki Bowen ’08, the school principal. “Let’s say you are in the middle of the game and your team is neck and neck with the other team, three to three,” she says. “What’s some positive language that you can use to root on your teammates?” Bowen walks across the room with one arm raised high, encouraging the girls to share their ideas. “You can do this,” suggests one student. “Be confident and not overconfident,” says another. “We’ll get it next time,” a third girl offers. That philosophy — a belief in self-confidence and propelling yourself forward, even when things look grim — is something Bowen can identify with, and not just for the students at Excellence Girls. It’s her personal story, too. Raised by a single mother in Brooklyn’s once-troubled Crown Heights neighborhood, Bowen escaped the dim educational options close to home to attend higher-performing schools with more affluent students, eventually winning admission to Choate Rosemary Hall, the elite Connecticut boarding school. Founded in Brooklyn’s Bedford-Stuyvesant neighborhood in 2009, Excellence Girls Charter School is part of the Uncommon Schools charter network, which operates 52 mostly urban schools known for embracing longer school days, test-driven teaching, and a strict approach to student discipline and behavior. (Charter schools are publicly funded but privately run; students typically are admitted through a lottery.) The focus on discipline is controversial, but the schools often outperform traditional public schools. Earlier this year, researchers at the Center for Research on Education Outcomes at Stanford University published an analysis that found students in Uncommon Schools gained the equivalent of 137 additional days of learning per year in math and 86 days in reading. Excellence Girls stands out for another reason: high test scores. During the 2015–16 school year, the vast majority of students tested met state standards in language arts and math, far surpassing the average for New York City schools, according to city records. This year, it was one of 329 schools nationwide to be recognized by the National Blue Ribbon Schools Program. Bowen’s journey from top student to educator began in Crown Heights, a once-blighted neighborhood known for racial tension in the 1990s and, more recently, a wave of gentrification. Bowen shared a one-bedroom apartment with her older sister and her mother, a social worker. Sensing that neighborhood schools were inadequate, Bowen’s mother sent her children to P.S. 236 in Mill Basin, an affluent, mostly white neighborhood about five miles from her home. Later she found both social acceptance and academic rigor at Philippa Schuyler Middle School for the Gifted and Talented, a competitive and mostly black and Hispanic school in Brooklyn. It was there that she learned about the Choate Icahn Scholars Program at Choate Rosemary Hall. The program, funded by business mogul Carl Icahn ’57, offered about 20 high-achieving, low-income kids tuition assistance, room, and board — and a $50 monthly stipend for personal expenses, Bowen says. She soon discovered the benefits of Choate extended far beyond her stipend. Though her experience in Mill Basin had been a lonely one, Bowen quickly immersed herself into Choate’s social life. She developed friendships with other Icahn scholars and students from New York City, played basketball, joined the rowing team, and studied in Spain; as a senior, she was elected student-government president. She applied to Princeton with a recommendation from Icahn himself. At Princeton, as she did at Choate, Bowen became active in campus life. An unexpected phone call changed her life. At the beginning of her junior year, she and some friends were preparing to see the singer Rihanna perform at Lawnparties, when the mother of her ex-boyfriend from Queens called to say he had been arrested for robbery and was being held at a youth correctional facility in New Jersey. Could Nikki go to the jail to see what was going on? Bowen agreed to visit him. She later did tell her Princeton friends what happened that day. The community she had left behind when she went to Choate and then to Princeton continued to tug, and after her visit to the jail, Bowen wrote her friend letters each week and visited him regularly. The experience deepened her interest in social justice. An anthropology major, she decided to write her junior paper on the impact prison has on “the mother, the lover, and the child,” using herself and his family as the subjects. She wrote her senior thesis on his mother’s struggle to maintain a relationship with her son. During her senior year, she was one of the first Princeton volunteers with the Petey Greene Program, which prepares college students to tutor inmates in prisons on the East Coast. She went to the jails a few times a week to teach basic skills — math, résumé writing, and computer skills — but felt frustrated when inmates didn’t always do the work needed to learn. It was partly that experience that led her to apply for a teaching job through Teach For America after graduation. On Commencement day, she got a call from Uncommon Schools, which works with TFA, with good news: She had been hired to be a first-grade teacher at one of its schools, Leadership Prep Bedford Stuyvesant Charter School. In the spring, as she contemplated giving up teaching, Bowen ran into the mother of a former student. After making small talk, the mother asked: Are you coming back next year? Bowen, who had yet to tell her principal that she didn’t plan to return, replied that she was still trying to “figure it out.” The mother scolded her. “‘What you teachers don’t get is that our kids — you have a huge impact on their lives. They love you all. They look up to you,’” Bowen recalls the mother saying. She resolved to stay — and by 2014, six years after her Princeton graduation, she was tapped to become the principal of Excellence Girls. She had a different view of things: She wanted her Excellence Girls students to be “loud and proud.” She developed a “fierce females” curriculum to expose the girls to accomplished women of color. Each morning the girls discuss how a famous woman embodies one of the school’s values: curiosity, love, sisterhood, justice, respect, courage, hope, and optimism. Following the curriculum and academic model of the Uncommon Schools network, Excellence Girls has a school day that begins just after 7 a.m. and ends at almost 4 p.m. — about two hours longer than the typical New York public school. Students are tested in math and language arts every six to eight weeks; if they don’t understand a concept, they will be pulled out of the classroom for more individualized instruction. To minimize distractions, behavior expectations are strict. The girls are expected to abide by “S.T.A.R.,” an acronym designed to remind them to sit up straight, track or look at the speaker, ask and answer questions, and respect others by waiting their turn. They’re told to walk silently in the hallways in straight lines with their arms by their side and their eyes looking forward. The goal is to make sure students don’t hit each other accidentally or talk so loudly that they distract other classrooms, Bowen says. The approach — often called “no excuses” — is not without its critics, who contend that the method is overly harsh and results in higher suspension rates, which may increase the likelihood that students drop out. (Two Excellence Girls elementary students received out-of-school suspensions in the last school year, the network says.) Teacher turnover in the Excellence Girls schools is high: 28 percent between 2015–16 and the previous year, according to state records — more than twice as high as the state average. To that end, Uncommon Schools provides three weeks of training at the start of every school year and professional development each week. Excellence Girls’ focus is not just on structure. Teachers often welcome students with a handshake and personal greeting; girls who are facing difficult circumstances at home, such as an incarcerated parent, are likely to be showered with extra affection, Bowen says. One afternoon in late spring, the balance between warmth and structure was evident in Amy Simon’s first-grade class, where girls sat cross-legged in perfect lines on a multicolored rug as Simon quizzed them on vocabulary, mathematical patterns, and the structure of a calendar. Students celebrated their success with snaps, hand waving, and even dancing. Bowen, the mother of a toddler herself, frequently can be found casually chatting — and sometimes holding hands — with other mothers at school. She calls herself “a hugger,” and says she feels a sense of camaraderie with the parents, seeing them as important allies in their shared quest to help kids thrive. Bowen says it can be hard to juggle the demands of being a principal while maintaining a life outside of school — a challenge that seems certain to become more difficult this year. In addition to leading Excellence Girls, Bowen was named principal of the nearby elementary school Excellence Boys over the summer. “You live and breathe this work,” she says. The greatest rewards are often intangible. Bowen received some at the end of the school year, when graduating fourth-graders wrote about the impact she had on their lives. “Ms. Bowen inspired me because she taught me that I can change history,” one student wrote. “Ms. Bowen’s life wasn’t simple: She had ups and downs but now she is a principal. Naomi Nix ’10 is a freelance reporter who often writes about the intersection between race, income, and education.